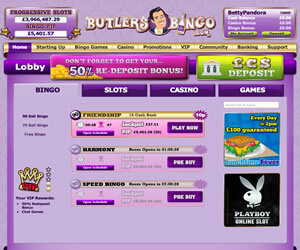 Butlers Bingo is powered by the popular Microgaming software and is one of the many sites that form the Microgaming Network. Land on the home page for the first time and you can see they are trying to portray a quality feel with a suave and sophisticated butler, a French maid and a bottle of champagne all waiting to greet you. The blurb at the bottom of the page states "The Butler brings you the best site for playing bingo online and Casino Games. Regardless of whether you are a bingo newbie, an expert chat game player, or a slots game specialist"; So we thought we would check if their claims stand up. 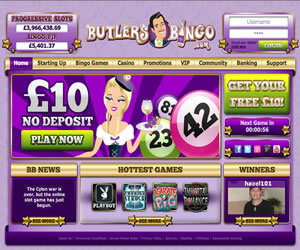 The Butlers Bingo home page is well designed with a rich purple colour scheme that adds to the quality feel of the place. The first thing you will notice is the progressive slots jackpot in the top left hand corner of the screen, which at the time of reviewing stands at a life changing £4 million! There is a large scrolling banner advertising their latest offers and promotions along with direct links to their hottest games. From the homepage you can also easily access all of their social networking pages or chat with 'Astrid' who deals with any of your live help enquiries. Registering for Butlers Bingo is a straightforward procedure and there is no need to enter any financial details until you have decided if you want to deposit or not. After entering the basic details you will be taken straight to the lobby where they will welcome you with some bingo bonus money so you can get a good feel for the place. If you like what you see and decide to deposit, you will need to enter your credit card details but you will earn yourself a large welcome bonus on your first deposit followed by reload bonuses on all future deposits. The lobby is made up of four tabs; Bingo, Slots, Casino and Games. Click on the bingo one and you will find that Butlers Bingo offer 75 and 90 ball bingo thorough a selection of rooms, but not all of these are available 24/7. Each one of the rooms gives you details on the costs of the tickets, the number of players, the jackpot, the progressive jackpot and the number of balls you will need to call in to win it. To the right of the page you will see two banners, one advertising their latest slots game and the other giving you details of that days guaranteed jackpot game. Enter any of the Butlers Bingo's rooms for the first time and you will see a little welcome message in the top left hand corner calling you sir, and letting you know your VIP level. There is a small chat room where you can make new friends and win yourself a bit of bonus money by taking part in chat games, along with a wide choice of mini games that can be enjoyed at the same time as your bingo. The right hand side of the screen is dedicated to showing your bingo cards, and there are plenty of built in options such as dauber shapes and colours so you can personalise your gaming experience. Butlers Bingo is a bit of a mixed bag when it comes to promotions as the majority of their weekly specials only pay out in bonus money. The online bingo site does host daily and monthly guaranteed jackpot games but you can find much larger jackpots elsewhere without finding yourself competing against a whole networks worth of other players. Butlers Bingo does have a free bingo room but this is for depositing players only, which in our opinion defeats the whole point, as free bingo is a great way to encourage potential players to see what you have to offer. Butlers Bingo is not the worst site we have seen but they are certainly not 'the best site for playing bingo online and casino games' as they claim. As with all networked bingo sites they are restricted as to what they can offer, and sadly do not have that spark that makes them stand out from the hundreds of other sites out there. Butlers Bingo offers 75 and 90 ball bingo. The 75 ball room is not open 24/7 and is only available from about 3pm. In addition to bingo the site also offers an impressive array of slot games including progressive games, one of which netted one of their players a massive win of nearly £6 million in 2012. 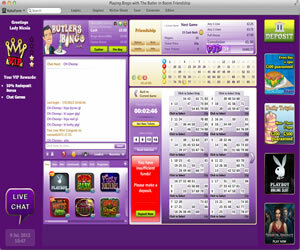 The wagering requirements at Butlers Bingo are 3x the total value of the deposit plus bonus money combined. For a £10 deposit this would mean you have to wager £150 before being able to withdraw (£10 free + £10 deposit + £30 bonus funds = £50 x 3 = £150).